A lot of what you'll find called "phonics" in mainstream bookshops is of variable quality. In among the chaff there is some wheat, but you have to be very clear about what you're looking for. Most high-quality synthetic phonics materials are at present only available from specialist suppliers or online (see Phonics Resources). A lot of "early phonics" materials teach the "sounds of letters" along "e is for elephant, u is for umbrella, x is for xylophone" lines. This suggests to learners that the only interesting letter in a word is the first one, and encourages them to read by looking at the first letter and guessing (these words are so long and hard, what else can they do?). It also suggests to them that there are only 26 sounds in English, when in fact there are 441. Mainstream bookshops usually have some materials that teach basic one-letter-one-sound relationships fairly well in short words like "cat", "men", "him", "on" and "up". However they often don't include the regular ending spellings ck, ff, ll, ss, ll, ve, tch and dge, and some don't cover the consonant sounds without their own letters – sh, ch, th and ng (English also has a zh sound, as in beige and vision, but that's used mainly with harder vowel spellings). A lot of promising-looking materials too-quickly mix in words with consonant blends like "flat", "pegs", "slip", "pond" and "grub", or even triple-consonants like the "spr" in "spring" and the "nks" in "tanks". For many learners with weak phonemic awareness or other language difficulties, that's too many sounds all at once. They need to consolidate one consonant either side of the vowel first. Many materials about consonant blends also only tackle blends at the beginnings of words. There are heaps of consonant blends at word endings e.g. in the words "champ", "desk", "fifth", "gold", "licks", "self", "tact", "punch", "melts", "bulbs", "bridged" and "lengths"
They also often treat blends as whole chunks instead of teaching learners how to build them for themselves, and thus equip themselves with the skills to tackle even unusual blends, like the one at the start of "sforzando" and "sphere". If all you're learning is the "sounds of letters' you may not be taught how to spell the 14 vowel sounds that are commonly used in one-syllable words, but don't have their own spellings. The "ay" in make, rain and say, the "I" in time, hi and my, the "oh" in home, go and low, the "ooh" in June, chew and flu and the "you" in use and few. The "ar" in car and last, the "er" in her, stir and turn, the "aw" in saw, for and more. The "ou" in out and cow, the "oy" in boil and boy, the "air" in care and fair and the "ear" in dear, beer and here. Most of these sounds also have less common spelling patterns that need to be learnt, so should be taught. For example, being next to a "w" sound makes several vowel sounds adopt unusual spellings e.g. the "aw" in war, wart and quart, the "er" in word, work and worst, and the "o" in want, wash and squadron. Some good materials are now available to teach vowel spellings, but too many of them mix one-syllable and multi-syllable words together from the start (e.g. car, park, farm, grass, last, palm, alarm, carnival, armadillo, drama, father, pyjamas, almonds…), so that learners have to deal with three hard things at once – new spellings, breaking words into chunks and managing the unstressed vowel. The best materials to introduce vowel spellings like "ay", "igh", "ar", "er", "aw", "ou" and "oy" stick fairly strictly to one syllable words. Beyond this, quality spelling materials can be pretty hard to find. There is a real shortage of activities that actively teach learners how to chunk long words, deal with the unstressed vowel and double letters, and learn the spelling patterns that appear mainly in longer words. One of the reasons I set up this blog was to make my activities on double letters, the unstressed vowel, and spellings like the "age" in bandage, cabbage and village, the "i" in alien, banksia and kiwi, and the "tte" in baguette, laundrette and serviette available to others (they aren't yet, but I'm working on this as fast as I can). Another problem for Australians is that many resources available here are written in American English, which has a final "r" sound (try saying "car", "her" and "for" with an American accent, and you'll hear three sounds not two) and a few other sound differences from Australian English (think of how Barack Obama says "news" and "daughter"). This means many US phonics materials have parts that make no sense to Australian English speakers. Thanks to the meddling of Noah Webster, Americans also spell many words differently from the mainly UK English spellings used in Australia (center, harbor, traveling, mustache, maneuver etc), as well as using a lot of different vocabulary from Australians (fall, pacifier, diaper, trash, vacation, gasoline, etc). UK English synthetic phonics programs (of which there has been a recent proliferation, thanks to good recent policy – click here for details) are more useful for speakers of Australian English, despite their lorries and crisps. Most of us aren't phased by either US or UK vocabulary differences anyway, because we've heard them on TV. Some teaching materials have two versions, in which case Australians should generally go for the UK version and avoid the US one. 1. Some people say there are only 42 sounds not 44, but it really just depends on how thinly you slice them. However, the point here is that there are a LOT more than 26 sounds in English. 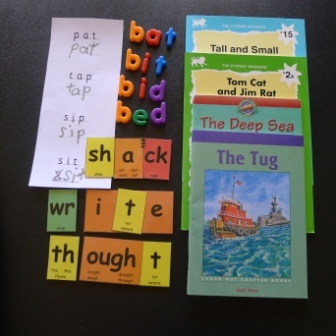 This entry was posted in blending and segmenting, consonants, phonics activities, sound-letter links, sounds, spellings, teaching strategies, UK/US spellings, vowels, word attack on July 18, 2012 by alison.